At full speed, the little steamer bore down on the bigger ship and fired a round from both guns, while the Hunters on board the United States peppered Fowell’s ship with rifle fire. Seconds after the boom of Fowell’s first broadside swept the river, Birge had a sudden attack of “seasickness” and retired to a stateroom, leaving Pierce in command. The Experiment let loose another round as it passed by. Accounts of the accuracy of Fowell’s gunners varies. Some sources, mostly Canadian, say all rounds hit the big ship but did no serious damage. Other sources, mostly American, say the shots missed. Whatever the truth, that first encounter left the United States unscathed. 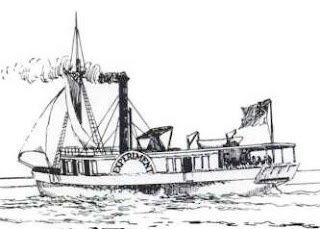 Pierce ordered the steamer downriver to protect the Charlotte of Toronto as it disembarked the first wave of Hunter raiders, about 70, and limited provisions. Both Hunter ships returned to Ogdensburg. The Experiment returned briefly to a station near Prescott. To Fowell’s surprise, the schooner fired back. Two Hunters fired a field cannon stored on deck. Again, accounts vary. Some sources, mostly Canadian, say the shot missed. Other sources, mostly American, say the shot swept through the Experiment killing and wounding many crew. Whatever the truth, the Experiment backed off. Both Hunter ships returned to Ogdensburg safely, though the schooner’s sails had been shredded by the grape shot. After the first day of the Windmill raid, Bill Johnston had a small role. For the rest of the Battle of the Windmill saga, visit Raiders and Rebels starting at installment #5 of the Windmill Battle series.